Get my Breakfast Bites E-book for FREE! 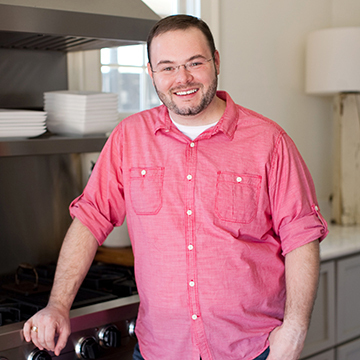 Get the latest recipes delivered right to your inbox and get my Breakfast Bites E-Book - all for FREE! This is a sponsored conversation written by me on behalf of College Inn®. All opinions are mine. For us, fall means busy afternoons and evenings. If we’re not running to soccer practice and games, we’re consumed with enjoying the beautiful weather (and trying our best to recover from the South’s wicked summer heat). Regardless of what we’re doing and where we’re headed, I’m always looking for quick and easy weeknight meals that offer up some stick-to-your-ribs kind of food with great flavor and not a lot of fuss. 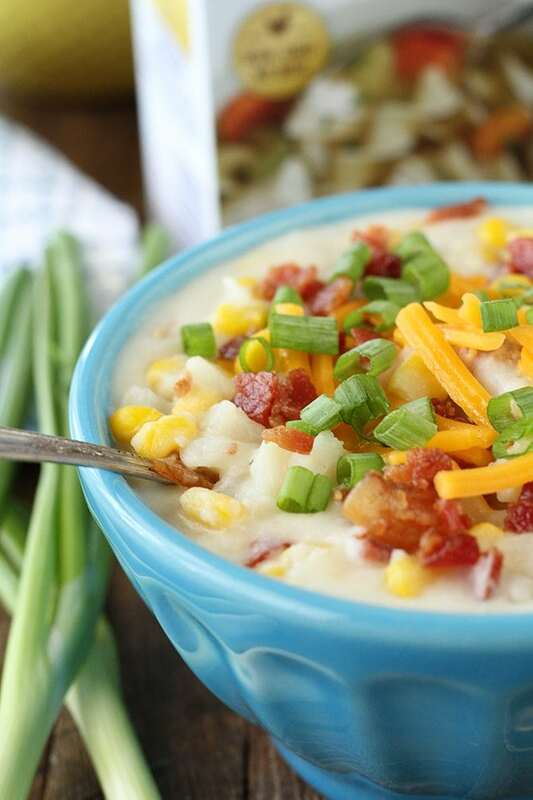 This Bacon Corn Chowder is the perfect thing for just that! The hearty, thick, rich broth is filled with smoky bacon flavor and sweet corn. And since the recipe calls for southern style hash browns rather than fresh potatoes, there’s no cutting or chopping — virtually no work at all! It comes together in less than 30 minutes and is as simple as opening some packages and stirring. You won’t believe how easy it is and once they taste it, neither will your family! 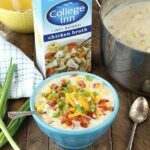 I really like using College Inn broth in this because it’s made with only the highest quality ingredients, like all natural chicken or beef, farm-grown vegetables, and the right blend of flavorful herbs and spices. And since there are only a handful of ingredients in this recipe, it’s the perfect way to add tons of flavor easily. 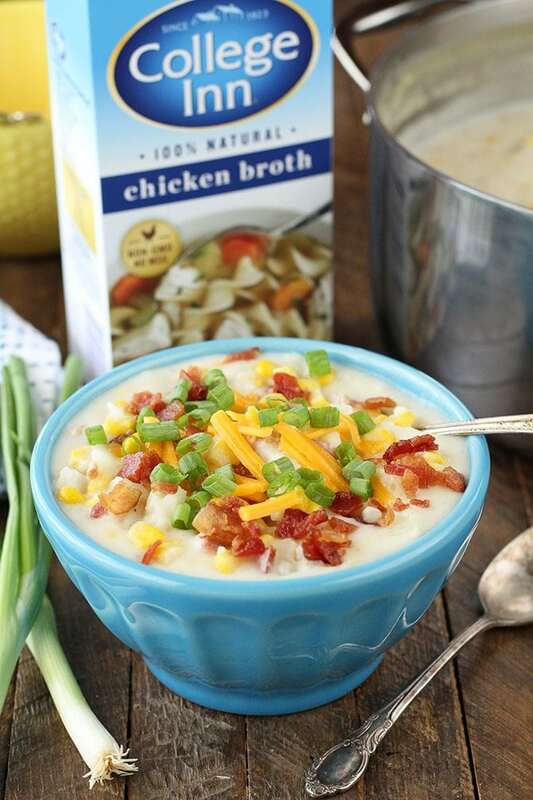 With simple recipes like this, there aren’t a whole lot of opportunities to add flavor and College Inn broth is the perfect way. My family just loves this one and you will too. If you’re looking for something with a little more heft, feel free to stir in a couple cups of shredded rotisserie chicken with the butter to add a little more protein, but we find it plenty filling on its own. 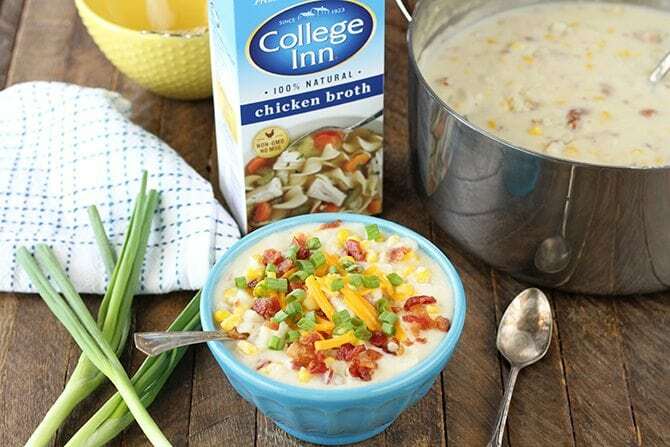 Try out this recipe and use #CollegeInnBroth in social media to show us how it turns out! Pour the broth into a large (at least 5-quart) stock pot. 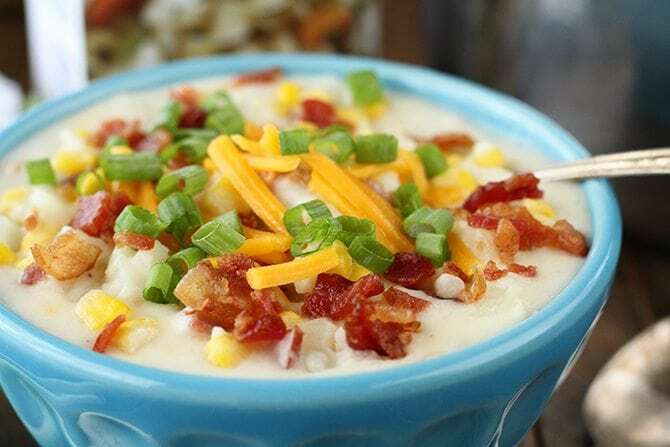 Bring to a boil over medium-high heat and stir in the potatoes, bacon, corn, and garlic and onion powders. Cook about 5 minutes. In a small bowl, whisk together the half and half and flour until well combined. Pour the mixture into the soup and whisk to combine. Reduce the heat to a simmer and cook until the potatoes are tender and the soup has thickened. Stir in the butter and add salt and pepper to taste. Serve topped with sliced green onion, shredded cheddar cheese, and additional bacon if desired. Making This Recipe?Tag us on Instagram: @SouthernBite using the hashtag #SouthernBite, so we can see what you are making in the kitchen! This is a sponsored conversation written by me on behalf of College Inn. The opinions and text are all mine. Did you see something on Instagram you loved? Click the image below to get the recipe. 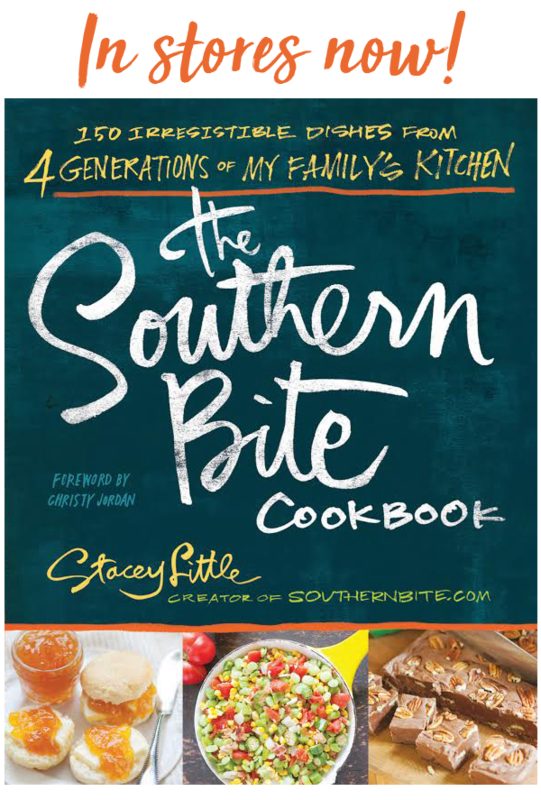 © 2009–2019 SOUTHERN BITE/STACEY LITTLE MEDIA,LLC. ALL RIGHTS RESERVED.